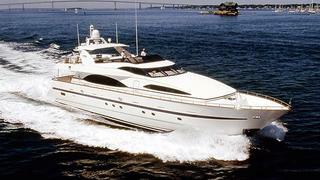 News in from the Fort Lauderdale office of Yachtzoo of a further $305,000 price drop Azimut’s 30.5m motor yacht Melimar. Built in 1999 as one of the yard’s Jumbo series, Melimar has been regularly upgraded and her hand-rubbed cherrywood interior features a five stateroom layout for 10 guests in a master suite, two VIP staterooms and two twin cabins. Twin 1850hp MTU engines power her to a cruising speed of 18 knots and a maximum speed of 22 knots. Available to view in Fort Lauderdale, Melimar is down from $2.3 million to $1,995,000.